As I write this, I am planning another trip (June) to Africa. More and more bowhunters are considering a once-in-a-lifetime trip to Africa, and well they should. It is indeed, one of the great bowhunting adventures you can take. There are always a number of questions bowhunters have about such a venture, so based on my experience with seven trips there, let me try to answer some of them. Understand that this is just my opinion, nothing less, nothing more. Actually, their winter is our summer, and that is the best time to go. Anytime from May to September can be good. June-September means less chance for rain, making water hole hunting all the better. The winter weather there will be chilly at night (maybe in the 40's) and in the morning as you ride to your blind, so take a heavier jacket, and light gloves. But things usually warm up fast to around 80-85 degrees during the heat of the day. And, in most camps, they will wash clothes every day or every other day, so you don’t need to overload for a 10-day bowhunt. Some countries frown on camo clothes, so check with your professional hunter before you leave relative to camo. What About Hunting Behind A Fence? 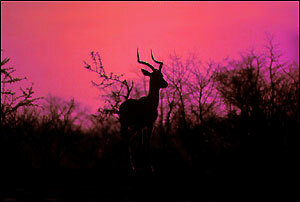 An Africa bowhunt is so much more than shooting nice animals - the scenery and wildlife are spectacular! fence except when you go in and go out. Should I Go Seven or Ten Days, and What Species Should I Hunt? It’s a long way to Africa, so you definitely should plan a 10-day bowhunt rather than seven. With two days on the front and back to travel, you are looking at a 14-day trip for a 10-day bowhunt. When you consider that the air ticket will run between $1500 and $2000, and that it cost $300 or so a day to bowhunt there, staying extra days is very worthwhile and cost effective. 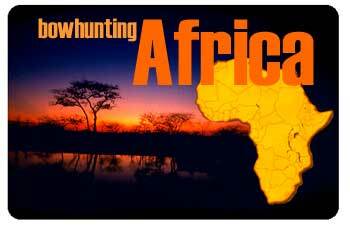 I strongly urge first timers to Africa to only hunt plains game (i.e., kudu, impala, wart hog, gemsbok, etc.). Dangerous game make a great bowhunt, but the experience you learn from a plains game hunt is critical before taking on the bigger guys. What Bowhunting Equipment Do I Need? It varies depending on the game. If you want to hunt eland, you need to be shooting 70 lbs. It can be done with less, but 70+ is best. For kudu, gemsbok, you are looking at 60+, and for impala and wart hogs and several other of the smaller species you can get it done with 50+. I know women who have killed all the above with lesser weights, but shoot the heaviest equipment you can shoot well. No expandable broadheads. These animals are very thick skinned and tough, and such broadheads are illegal in most countries. 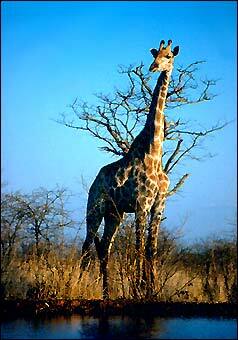 Light-weight arrows and light broadheads can cause problems in Africa. Just as it is here, a well-placed arrow is more important than speed or bow weight. Zimbabwe 5 times and have decided not to go there until Mugabe settles down - or is removed. However, I know many bowhunters who are going there now with few, if any, problems. South Africa is very safe, however, you should be cautious about Johannesburg. Have your professional hunter meet you at the airport, inside. Do not let a stranger handle your bags. And night time out in Joburg is a no-no. Having said that, in general, South Africa is very safe. My last trip, and my next, are to Namibia. A very rural country and very safe. What about snakes? They will not be a problem. You may see one, but on most trips you will not. What about insects? No mosquitoes in their winter, but you will be taking malaria pills just in case. There can be ticks, and though I’ve never been bitten, I know two bowhunters who have. When bitten by a tick, you need antibiotics right away. Some insect spray would probably keep ticks away, but the odor might also scare game. Should I Take My Mate? 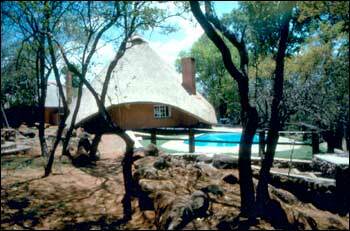 Many bowhunting safari accommodations are better than the best Caribbean resorts. This camp had luxury tents, a swimming pool, and all the food you could consume. of $100 a day for non hunters in camp, it is well worth it. The experience is very worthwhile as a couple. You do not buy a license. Rather you pay a daily rate plus you pay for every animal you shoot (i.e., trophy fees). Daily rates are between $200 and $300 a day. Trophy fees vary a bit, but in general a kudu is around $700, gemsbok $700, zebra $800-1000, waterbuck $1200–1500, impala $200, wart hog $200. There are package deals offered that combine daily rates with trophy fees, but often they are not good bargains because they only offer a 7-day hunt and sometimes the species that are included in the package are not the best. Be careful with package deals. Other costs are tips, and you also pay for animals you wound. There may be a shuttle fee from and to the airport. You will also have to pay to have your animals shipped home . . . usually shipped within three months after you leave Africa. Those costs will run around $500 or so depending on number of animals. My strong recommendation is to have animals mounted in the states. It’s cheaper in Africa, but in my experience, quality here is better.